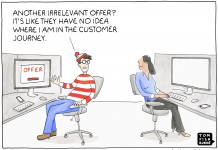 Every marketing channel suffers from fatigue at one stage. Whether this is due to an increase of competition, rising costs of competing or hitting a ceiling of volume, every business will face the challenge of seeing diminishing returns on a once high-performing channel for them. This creates an opportunity to focus on adopting new channels that have potential at an early stage to reap the rewards. While the channels are still above the “Cost to compete” line in the chart above. Just take video ads on Facebook as an example. We’re currently at a point where video ads are reaching their peak; cost is still relatively low, and engagement is high, but, like with most ad platforms, increased competition will drive up those prices and make it less and less viable for smaller companies (and larger ones) to invest in it. Being an early adopter of a new channel can provide enormous benefits, but that comes with equally high risks. This is amplified within marketplaces like Amazon. 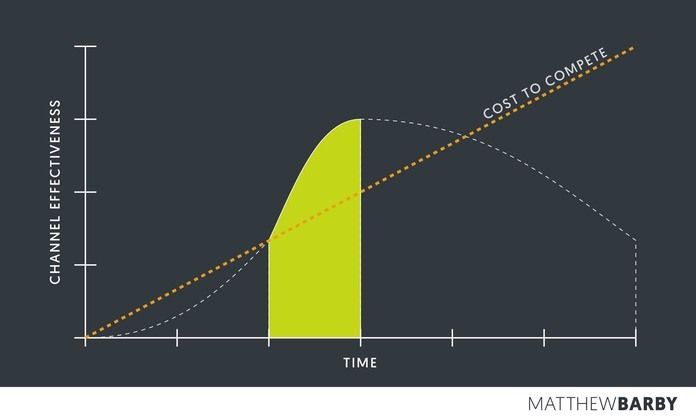 Early adopters within Amazon’s marketplace were able to focus on building a solid base of reviews for their products – a primary ranking signal – which meant that they’d create huge barriers to entry for competitors (namely because they were always showing up in the search results before them). While the payout wasn’t huge within the early days of Amazon, those who got in early are now seeing huge rewards. On the other hand, early adoption can be somewhat of a curse. In 2011, many companies and individuals, invested a lot of time and money into Google+, dubbed to be bigger than Facebook at the time. I don’t need to explain further, do I? 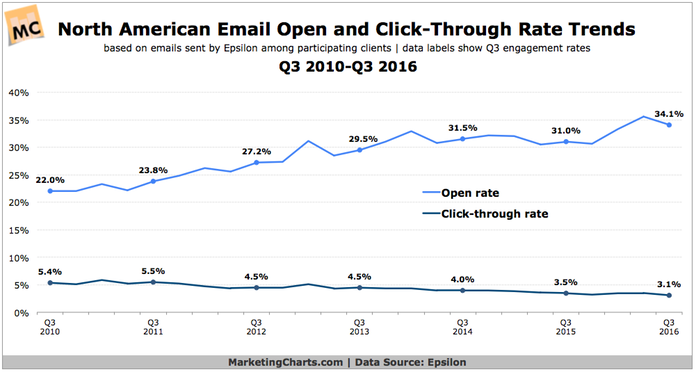 Email click rates are steadily declining. A chatbot is a service powered by rules, and sometimes artificial intelligence, that you interact with via a chat interface. The service could be any number of things, ranging from functional to fun, and it could live in any major chat product (Facebook Messenger, Slack, Telegram, Text Messages, etc.). Awareness around chatbots is starting to grow, especially after Facebook came out mid-last year with their new Messenger platform that supported chatbots. Facebook even allows you to make payments via Messenger bots, opening up a whole world of possibility to e-commerce stores. 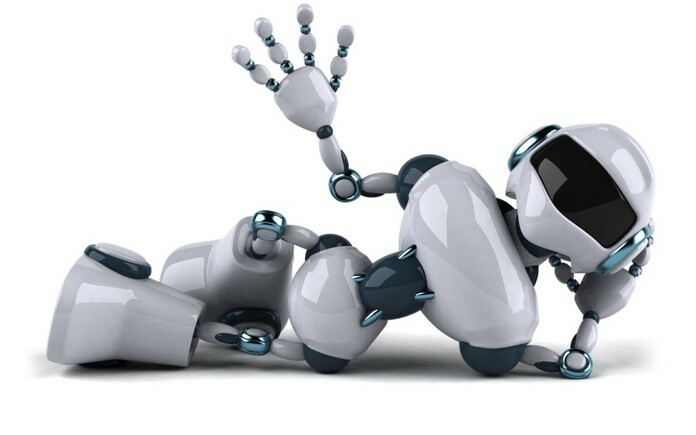 Bot experiences with more engaged audiences are getting 80-90% response rates. As soon as someone engages with your chatbot, you can push messages to them within Facebook Messenger with very few limitations. You can use input from users to dynamically segment them into groups and serve different content to them. You can set up automation workflows in the same way that you would via email marketing automation. Click-through rates and general engagement is very high at this stage. You’re more likely to get engagement within Messenger than from within your Facebook page because the communication is 1:1 and you’re not competing with others in the newsfeed. Facebook has opened up the ability to run ads directly to Messenger. This means that anyone that engages with your ad can now be followed up with directly within Messenger (this is incredibly exciting). 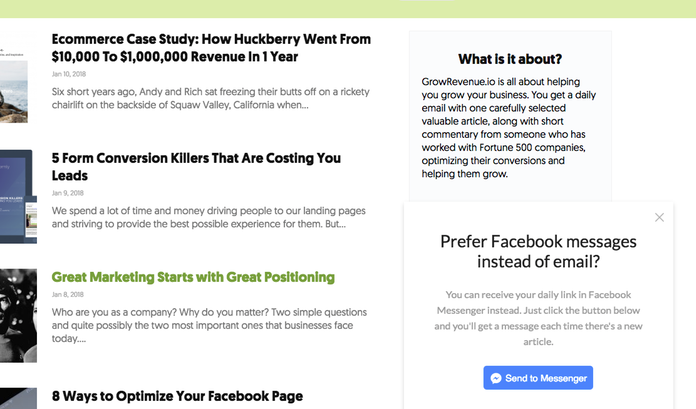 The last one could be a solution to a problem that people don’t read their emails anymore. 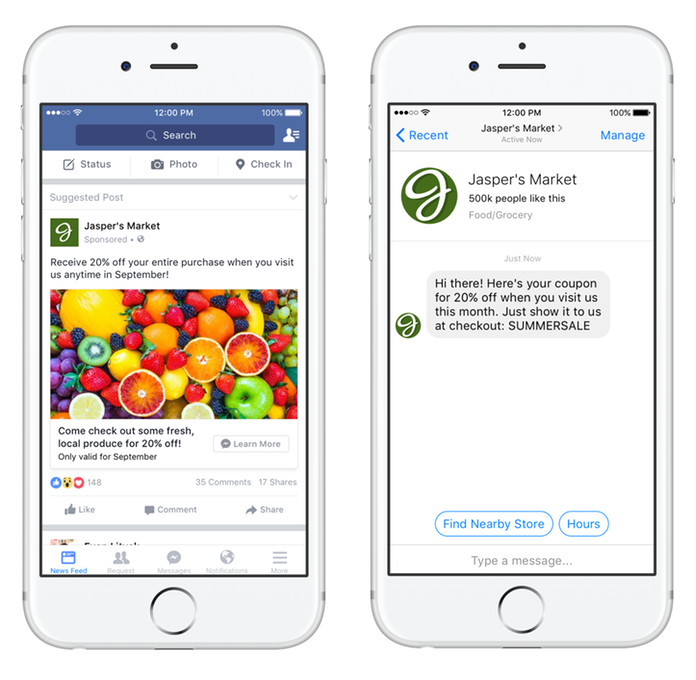 Engage with an ad, get a coupon straight to your Messenger. All within single visit/experience. How can you create a chatbot? You can go from an idea to a fully functioning chatbot within a matter of minutes, and it won’t cost you anything. You can use ManyChat, or Chatfuel, or Botsify. I’ll spare you all the technical details of setting it up. If you want a step-by-step guide, read the linked article below, or install any of the bots above. What can you use bots for? Late last year (like really late, I think it was December 30th) I have installed a bot on GrowRevenue website. I haven’t done any promotion of it. I haven’t mentioned it anywhere. It just sat there, and I wanted to observe what would happen. If you want to see the bot in the wild and experience it first-hand, go to GrowRevenue and play with it. It won’t bite, and you might just like it enough to adopt one yourself. Ultimately, only time will tell how effective the likes of Facebook Messenger will become in the long term. As more and more companies look to use chatbots within the platform, the greater the frequency of messages that individual users will receive. This could result in Facebook (and other messaging platforms) placing stricter restrictions on usage, but until then I’d recommend testing as much as possible. PS. Here’s how I like to imagine my bot. Playful, helpful, friendly. He likes cryptocookies and dislikes spam. Go get acquainted, he’s really lovely.